Virtually unlimited budgets, the pressure of the public spotlight, and unbridled access to all that the beauty and fashion industries can offer: the life of a celebrity requires being on top of all the latest trends, so it stands to reason that the rest of us look to celebs for everything from hairstyles to make up to clothing. Likewise, when considering what type of engagement ring to buy, it can be helpful to take a peek at the fingers of celebrities for inspiration. Take a look at some of our favorite celebrity inspired Brilliant Earth engagement rings. Pear shaped diamonds, or “teardrop diamonds”, are named for their unique shape, one that features both a rounded and pointed end. This distinctive combination of the classic round cut with the stylish marquise diamond shape gives it an elegant and elongated appearance that is sure to stand out—making a pear engagement ring perfect for the celebrity bride-to-be. Some noteworthy celebrities with pear engagement rings include Elizabeth Taylor, Margot Robbie, Victoria Beckham, Paris Hilton, Cardi B, and Sophie Turner. “Going green” is an oft-heard phrase these days, and while it may not conjure an image of a flashy celebrity engagement ring, eco-friendly rings are becoming quite popular with both celebrities and women in the know. As we become increasingly aware of the impact our choices and activities have on the environment, the options we have for living a “greener” life have expanded. 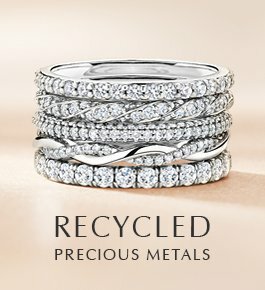 It is now possible to proudly wear your commitment to both the love of your life and the preservation of the environment with a green engagement ring. Meghan Markle’s engagement ring is a beautiful three stone engagement ring, featuring two recycled heirloom diamonds from Princess Diana’s personal collection, and a center cushion diamond from Botswana. 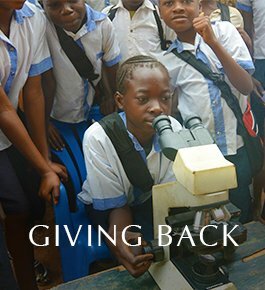 Choosing a diamond from Botswana also reflects Prince Harry and Meghan’s shared commitment to social and environmental responsibility. Botswana diamond mining has contributed to transforming Botswana into one of Africa’s most prosperous countries, and Botswana diamond mines are dedicated to minimizing their environmental footprint. 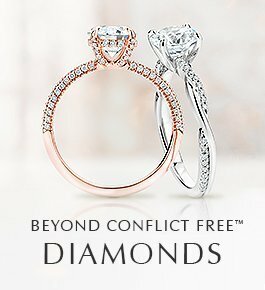 We are proud to offer Botswana Sort diamonds as part of our selection of Beyond Conflict Free DiamondsTM. PHOTOGRAPH BY GEORGES BIARD, DISTRIBUTED UNDER A CC-BY 2.0 LICENSE. 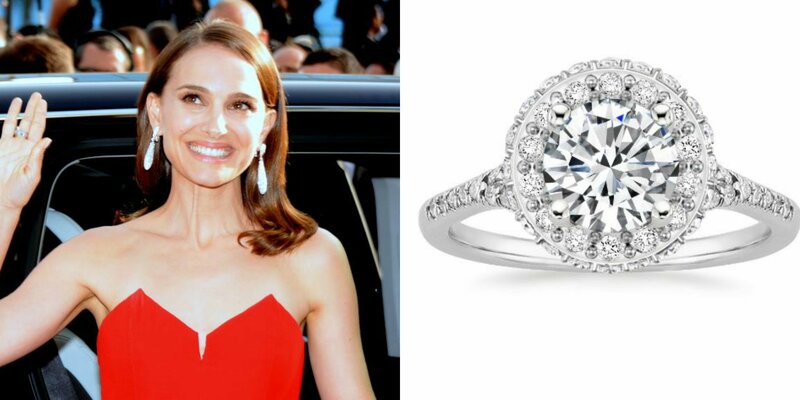 Actress, activist, and vegan, Natalie Portman, does just that with her recycled platinum engagement ring. Her extraordinary ring features a 4-carat antique round center stone surrounded by a double halo of pavé diamonds. Antique engagement rings are an up-and-coming trend and celebrities are naturally at the forefront. 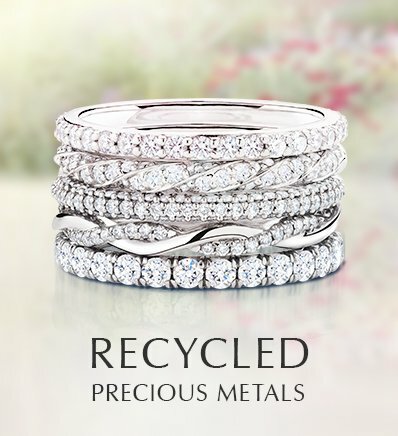 Antique rings offer one-of-a-kind beauty – each antique ring is unique and evokes the romance of a bygone era. A decade after Michael Douglas gave Catherine Zeta-Jones her astonishing 1920s marquise diamond ring, it remains one of the most recognizable celebrity engagement rings. It features a 10-carat center diamond encircled by 28 smaller diamonds. 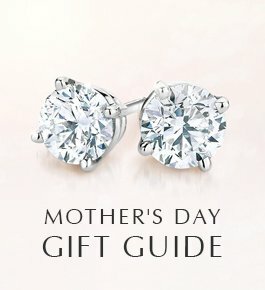 Impressed by the unique yet timeless quality of antique engagement rings? Bookmark our one-of-a-kind antique ring collection to see the latest antique rings as they arrive. It comes as no surprise that halo rings are incredibly popular among celebrities. Their glamorous design – a center gemstone surrounded by a “halo” of smaller accent diamonds – packs an impressive visual impact. Halo engagement rings can feature both diamonds and sapphires; in fact, the most widely recognizable halo ring has an elegant sapphire as its centerpiece. Have you guessed whose it is? Here’s a hint: it used to belong to Princess Diana. 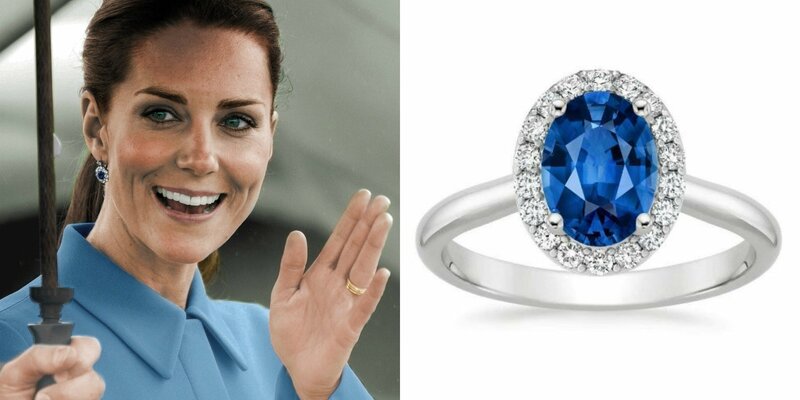 The halo ring that now graces Kate Middleton’s royal finger is a round 18-carat oval sapphire set in white gold. 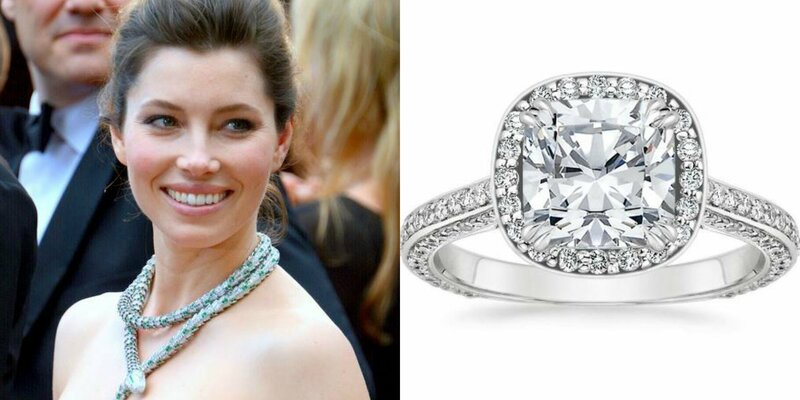 Jessica Biel’s engagement ring, a gorgeous emerald-cut diamond encircled with a halo of pavé diamonds, was carefully selected by her superstar husband, Justin Timberlake. It has both antique and modern elements, and even includes subtle touches of aquamarine, Jessica’s birthstone. For those inclined toward the elegant brilliance of a halo engagement ring, we recommend the dazzling styles in our Halo Collection. Celebrities like to stand out from the crowd, and a vibrantly colored diamond engagement ring is a popular choice for those who want to express their individual style. Recently, gemstones and diamonds in pink and champagne hues have been spotted on the likes of Lady Gaga, Rihanna, and Princess Eugenie. 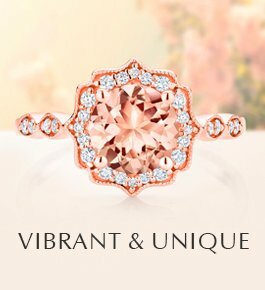 We’ve seen this trend translate into the engagement and wedding space, as Whether you are looking to add an eye-catching pop of color with a pink gemstone, or you want to add a subtle hint of warmth with rose gold, you can’t go wrong. Did you know that having a diamond as the center gemstone in an engagement ring is a relatively recent tradition? Throughout history, different types of gemstones were commonly selected to be the centerpiece of engagement rings. Sapphire engagement rings are a popular and distinctive alternative to traditional diamond engagement rings, and actor Javier Bardem is wise to the trend. He presented Penelope Cruz with an alluring vintage ring featuring a 3-carat oval sapphire surrounded by diamonds. 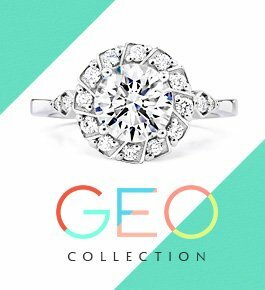 We take many style cues from celebrities, and you may not need to look any further than Hollywood for your perfect engagement ring inspiration. 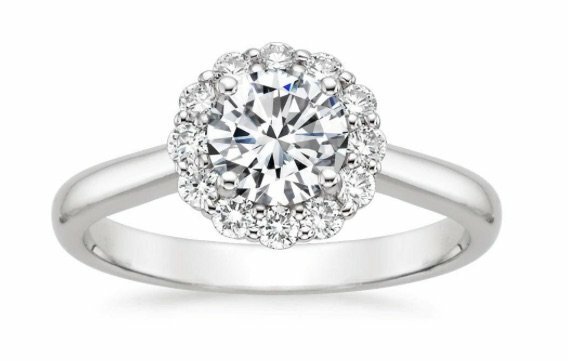 At Brilliant Earth, we offer a wide variety of beloved styles that achieve a timeless take on sought after celebrity engagement rings. Which celebrity style is your favorite? Let us know in the comments below, or on our Twitter, Facebook, or Instagram! I love the engagement ring Prince Charles gave to Princess Diana, the huge blue sapphire surrounded by the diamonds.It’s very special that Prince William gave the ring to his Princess Kate.A memento of his beloved Mother, Princess Diana, is very precious & sweet. Penelope Cruz’s ring is a subtle combination of a color and a clear diamond. 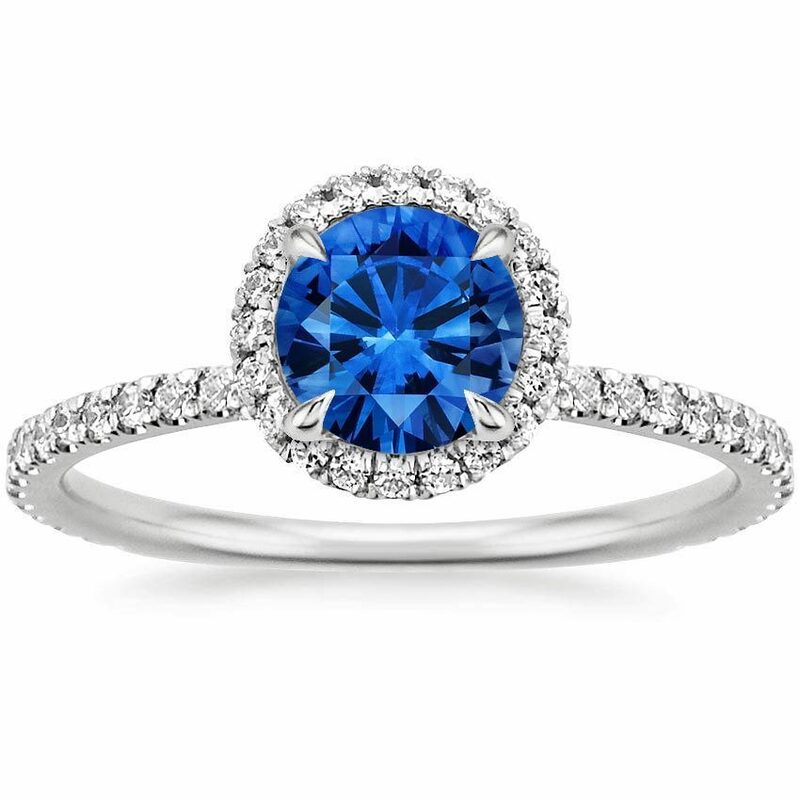 The color in this case is a very calming, soft sapphire color, not the usual deep blue of the sapphire. This color is so tender and soft that it is kindly refreshing as a sapphire. I love the rings that Kelly and Carrie wear. Beautiful. Quite an interesting quiz. Very short and to the point. This is a unique quiz. Interesting! I found this informational and detailed, great job! Magical and Mystical. Jewelry.Dreamy and Spellbinding.Forever.Symbolic. Cherished. Worshipped. Somethings can last forever till the end of time. I never had an engagement ring given to me…i would luv luv luv anyone of them! Interesting and useful games and jewelry looking toward to win? I do not need the rings but I do need the money very very very much more!!!! I do not need the rings but I do need the money very very very much more!!!!#! The rings or nice but I need the money more than anything else. The rings or nice but I need the money!!!!! I have a $25,000 diamond ring which I received in 1960 from my beloved husband of 57 years! women still care about engagement rings! Stuck in the 50s and 60s I guess! I mean, who cares? I love all of them but… my favorite is Catherine Zeta-Jones. This ring is antique but resembles a very modern look as well; so refreshingly lovely!. I have my grandmother’s rings from 1931. I’ve been asked to have them appraised by a jewelry store that my husband has done business with but I won’t take them off. They don’t understand that they can’t put a price on them, it’s the fact that they were on my grandma’s fingers for so long and the connection that I feel from them that gives them their greatest worth! 20 yrs later it is now my daughter’s but her setting is “busy” and the classic emerald needs no help getting attention. I wish I had it back. Appraised at 6,000.00. But it was its beauty that mattered. Do stunning things with it as it is an amazing stone! Very nice vut i dont need one yet. 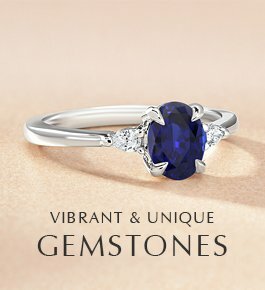 You can create your own gemstone ring on our website here: http://www.brilliantearth.com/colored-gemstones/. You may be interested in our selection of moissanites. You can also contact our jewelry specialists for more information about our selection at 1.800.691.0952 or by using the live chat on our website. Thanks for your interest! Wiuld luv to see rings similuar ti real diamond rings 1 to 1in a half Carats but simulated diamonds or cz’s which I can afford.